Sermon the Feast of Saints Apostles Peter an Paul. Peter loved Paul and Paul loved Peter. They loved each other, despite their disagreement, because they loved the Church and each served her according to his personal ability. They loved each other because they realized that they are members of one body whose head is Christ and because they realized that the characteristic of the body is diversity. Each member has a role and no member can deny the importance of another. The success of the one body results from each member performing its role in harmony with the other members and with the Head. The great Peter and Paul differed, but neither hurled anathemas or excommunicated the other. Rather, they both listened to each other’s criticisms with great humility and they compromised where compromise was necessary in order to preserve the unity of the growing Church. Their concern was to preach Jesus Christ, not their own ideas. Peter, to whom Jesus said “You are Peter (rock) and on this rock I will build my Church… I will give you the keys to the kingdom of heaven” (Matthew 16:18-19), did not act proudly. Rather, he listened to Paul who says of him, “Now when Peter[a] had come to Antioch, I withstood him to his face, because he was to be blamed.” Then he accuses him of hypocrisy and incorrect conduct, because when he was away from the Jews he would eat with the gentiles, but when Jews were present he would not eat with them, fearing his countrymen (cf. Galatians 2:11-14). Peter retreated before Paul, he retreated before the one speaking the truth. He repented of his hypocrisy and cowardice. Peter and Paul are together the model of the unity of the Church, based on the principle of diversity and respect for individuality. The condition for unity is diversity and the condition for diversity is unity. Christian dogma is based in principle on faith in the Most Holy Trinity: Father, Son and Holy Spirit: one God. Thus, there can be no correct theology without affirming “diversity in unity” and “unity in diversity”. Divine unity does not eliminate the particularity that distinguishes the Father, Son and Holy Spirit. Likewise, diversity does not mean individualism, exclusivity, or the absence of creative relationships. 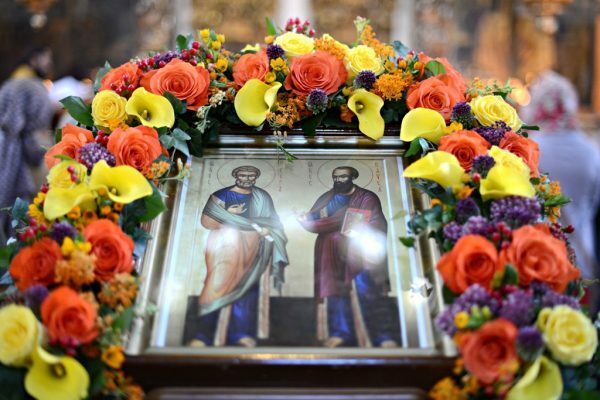 As the Church celebrates the Feast of Saints Peter and Paul, Crowns of the Apostles, this coming Monday (Pravmir’s note: the article originally appeared in 2014), she intends to remind us of the importance of respecting diversity, especially the diversity of gifts. The Church is neither Peter alone nor Paul alone… The Church is Christ, her head, Peter, Paul and all together.